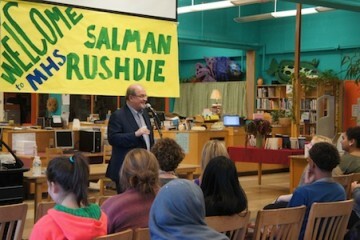 When Salman Rushdie invited Madison High School students to ask him questions on his Tuesday afternoon visit, several hands shot up into the air. He smiled. “What inspired you to be a writer?” asked one student. “Writing is not what I do,” Rushdie replied. “It is who I am.” He continued explaining, and each of his responses was thoughtful and lengthy; he put in as much thought to his answers as the students had in studying his work and crafting their questions. 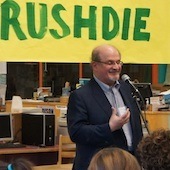 Rushdie also noted that his sixteen-year-old son, whom he wrote Luka and the Fire of Life for, said to tell the Madison students hello. “He wanted you to know that this is his book,” he said with a laugh. Rushdie has two Young Adult novels–one for each of his sons, who are eighteen years apart. He mentioned being pleased about receiving letters from people who read and loved his first YA book as teens who are now sharing the second book with their children. 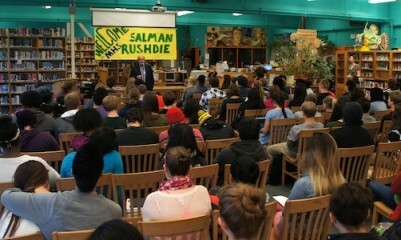 In addition to questions about his novels, especially The Satanic Verses, which resulted in a fatwa that kept Rushdie in hiding for twelve years, students asked about his journalistic work. Rushdie shared his philosophy about writing pieces for the Op-Ed pages of the New York Times, noting that an opinion piece should not merely echo the common consensus, but should “break you out of the box” and make readers re-consider an issue from another perspective. Of course, Rushdie was also asked about the catalyst for becoming a good writer. Thanks to Portland Public Schools, we have his full response in a video. 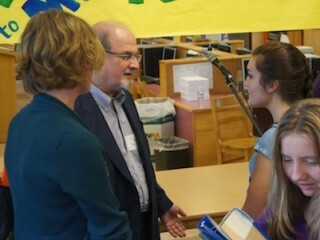 Thanks so much to Nancy Sullivan, the Media Specialist, and Principal Petra Callin for having us bring Salman Rushdie to visit their very well-prepared students at Madison High School!